Image credit: Rahr & Sons Brewing Co.
Rahr & Sons Brewing Co. of Fort Worth has announced additional details related to the release of three beers appearing on its 2018 production calendar. 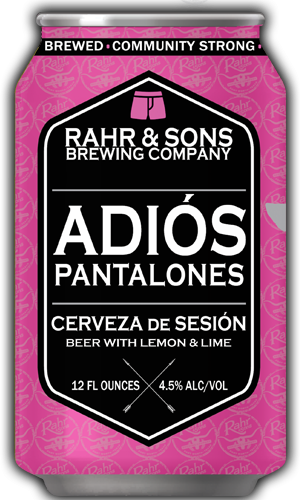 The first of these is Adiós Pantalones, a beer brewed with lemon and lime that Rahr & Sons is billing as a Cerveza de Sesión (session ale). One of two new entries into the brewery's year-round lineup, Adios Pantalones is described as a refreshing, light-bodied beer that can be enjoyed with just about anything. 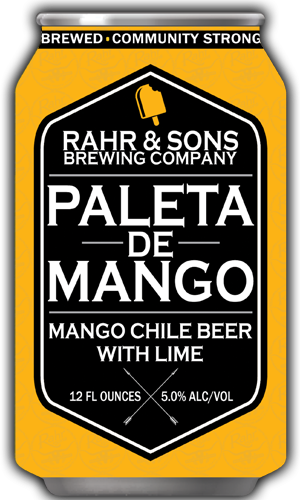 Also set to join Rahr & Son's regular rotation is Paleta de Mango, a mango and lime beer crafted with Mexican pequin chiles. Originally brewed as a collaboration with Casa Cervecera Morenos of Mexico, it was created for the Cerveza México trade show in Mexico City this past November. The result proved to be popular, so the decision was made to brew it again and make it a new full-time fixture. These two beers will debut during a special Cinco de Mayo event to be held at the Fort Worth brewery on May 5, 2018. Tickets for the event, which includes an appearance by the world's first metal mariachi band, Metalachi, are on sale now at the following location: https://rahrandsons-brewing-company.ticketleap.com/metalachi/. 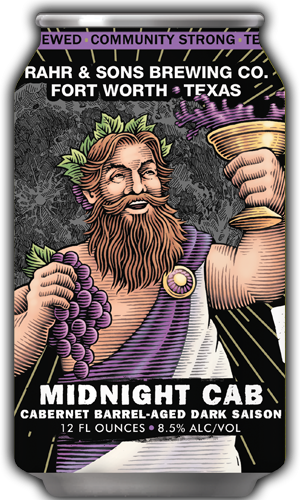 As for the last of the aforementioned three beers, Rahr & Sons will package the seasonal favorite, Midnight Cab, for the first time this year. For those who may not be familiar, Midnight Cab is a black saison that's been aged in French oak cabernet barrels. Featuring notes of white pepper, black tea and currants, the beer will hit the market beginning in April. Look for it on tap and in four-packs of 12-ounce cans.